Are you ready for a sweet treat that’s super easy to make? My mom passed this recipe along to me years ago (she cut it out of our local newspaper long before that), and now it’s one of my go-to, easy dessert recipes. It’s especially popular with my boyfriend who’s got a sweet tooth for fruity desserts, and I love being able to make it for him so easily. It’s called a blueberry flip flop. Interesting name right? Well, there’s a reason for that. When the dessert is first put into the oven, the fruit starts out on top, but by the end, it’s at the bottom. Hence the ‘flip-flop.’ This dessert is light, moist and perfect for dessert, along with coffee or just as a snack anytime in between. 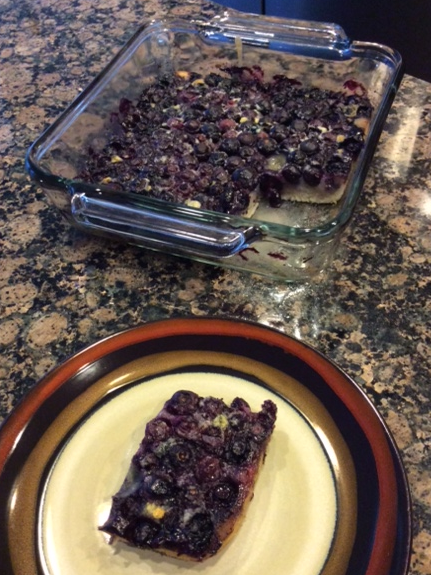 So, I made this recipe with blueberries, but you can also sub in pears, apples, or any other generally firm fruit that you’d like to. I hope you enjoy and let me know of your favorite, easy, dessert recipes. Cut butter into chunks and toss into a 9″ glass pie plate (I usually use a Pyrex glass baking dish), for 5 – 8 minutes while butter melts. Meanwhile, whisk dry ingredients together in mixing bowl. Add milk and vanilla extract and mix in until batter is smooth. Pour batter over the hot butter in the pie plate. Sprinkle the blueberries over the top of the entire batter. Bake for 45 minutes, or until top is brown and toothpick in the center comes out clean. (As flip flop bakes, fruit will sink to the bottom forming its own layer). Allow flip flop to cool for 30 mins, then dust with powdered sugar if desired. Serve slightly warm straight from the dish. Ta – da! Flip flop fresh out of the oven. 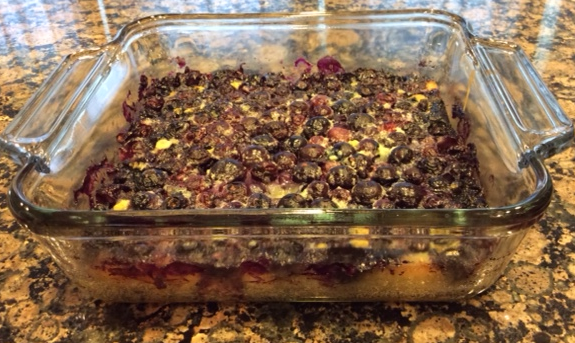 This entry was posted in Desserts, Recipes and tagged Blueberry, Desserts, Easy, Flip Flop, Recipes on May 28, 2014 by Paige N..